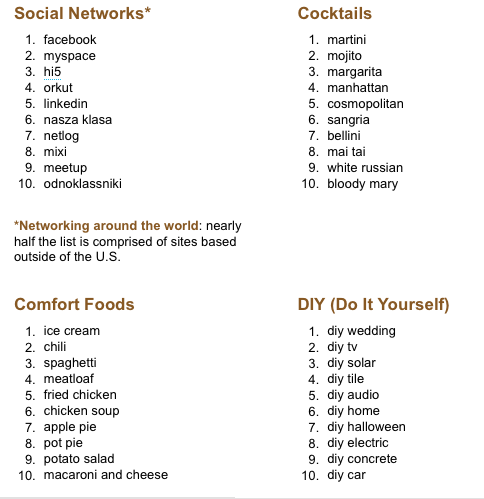 Google released its 2008 Zeitgeist list of the most popular search terms for the year. Unlike Yahoo’s 2008 list of top search terms, Google looks at the fastest-rising searches of the year. That makes for a slightly more interesting list. (Yahoo’s list was basically a repeat of its 2007 list). Below are the two lists, and you can compare to Google’s list for 2007, which was dominated by technology searches (”iphone,” “facebook,” “youtube”). This post was originally posted by our content partner Techcrunch and is being republished on ShoeMoney.com with permission. I am sure that there is some statistical term which describes the drop of a spike in terms like hybrid or lay-away. That doesn’t mean interest wains, but people have just gotten the info they needed. That is, if gas was still $4 a gallon, there would still be a drop in hybrid. Great point about Google vs. Yahoo. Miley Cyrus? Kidding me? No wonder Yahoo is on the ropes, they can’t even realize to copy Google to come up with new, relevant terms. ABC national news, last night, did a whole segment on Google’s top terms. Free marketing. Then, Yahoo gives us Britney Spears at #1. Wasn’t her kids and MTV “dance” performance last year? Thought she spent most of ’08 in rehab or an asylum? It’s catch up in a few years. If anyone wouldn’t want to buy it first. yahoo is not the best search engine in many perspectives. But there are times, when yahoo has given me better search results than google. Though very rare..
You’re comparing apples to oranges. Google’s Fastest Rising Search Terms in 2008 should not be compared to Yahoo’s Top Searches in 2008. These are 2 different types of data. One measures increasingly popular search terms, while the other measures the top searches actual made. Also, you have to take into consideration that these 2 search engines attract different types of users. It seems to me that Yahoo caters more to people looking for entertainment news, while Google probably appeals more to people who are doing research. I concur, but I don’t think that was the overall point? I think the argument was that yahoo didn’t even serve apples. As jtGraphic said Yahoo had no apples. I imagine Google had the same top searches, when highlighting the year they are smart enough to give us a different top searches for the year. Which would mean that people don’t distinguish between Yahoo and Google, as one entertainment and one research. Besides, people (bulk doing searches) don’t really do “research” on the web. That’s like saying watching TV is supporting the arts. Thanks….Some really interesting stuff. surprising fall of the search term “hybrid car”. Thought that it should only rise more?? 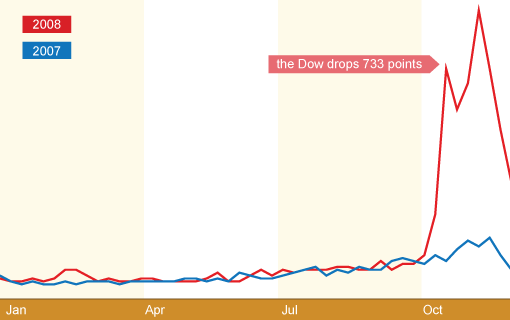 wow cool data… obviously political terms has to go up this year. I agree pretty typical searches. Lists such as these are great for marketers. We can adjust our keyword use in blogs and website to coincide with the market tendencies. I’d like to see the top 100 or top 1000 instead of the top 10 to take advantage of the long tail keywords. For MMO the Yahoo list could hold more value. Try monetizing Beijing 2008 now. Sarah Palin and Heath Ledger will be on a steep decline. What Yahoo’s list shows is that campaigns built around their top search terms have legs. Yeah I’ll definitely be adding the word “facebook” and related searches to my trends to watch list this year. “Surf the Channel” is that really so popular? I must be really old. I guess its something I need to check out. I have been using this data for a few days now … very helpful! This is great stuff! Ahh I see a trend here! Google users are more interested in world news and politics while Yahoo users are more interested in entertainment news! Face book is still the giant man. If someone could come up with a new stuff to make money with facebook. Thats it, another millionaire is born! thx for posting some interesting stuff in it where did you get it from? lol sorry it is I just did not see it the first time. Wow, very interesting Shoe. Most especially “Google’s Fastest Rising Search Terms for 2008 (Global)” list, it’s strange how Sarah Palin was searched more than Obama. Hmmm… very interesting indeed. Great data. I could see how one could base their affiliate programs around the trends and what is rising in popularity. Shoemoney didn’t make the list?!? dont have a clue about what is jonas brothers..
i am deffinitely going to use these trends into my new business site idea that is merely a trend machine! Jonas Brother’s beat Hanna Montana! Ha! hello, I would like to know how I can make my blog a few months I will generate huge profits equivalent to a minimum of 20 000 dlls a month,I need only a good ranking in google and have a good design in my blog or need anything more. Pingback: Purposeinc Poker Tournament » Get Noticed - Link to me - or talk about me like Joe did! I bet Sarah Palin has fallen right off the records since this report. She is long gone, thank god. palin will be back. I feel like 2012 maybe? i don’t think we have heard the last of her. the republicans don’t have many young stars right now. bit bizaare to see ‘surf the channel’ rising fast as a search term? Layaway being a popular search term doesn’t surprise me in the slightest. More and more people will have to take this approach very soon to purchase items that they want. Dam that’s a high quality post right there. 5 Stars for sure. Wish I got my sarah palin websites out sooner!! For the marketers that target the right terms, it is like a gold mine for them! I didn’t understand why yahoo search terms are always same. 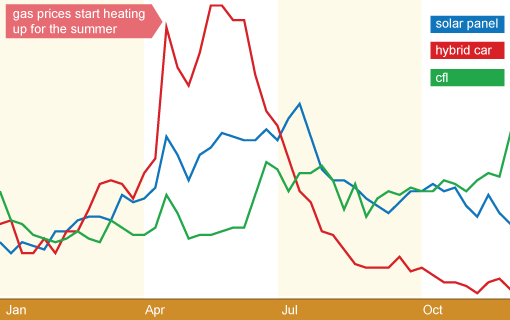 We can understand google search terms why means people always search for current hot topics. Very interesting information. Google has a huge amount of information. Google is lord of the information world. I am always curious what the most searched terms really mean, I mean, like why should I care. If they are people names, what can I really do about it. The results are not all that surprising. Sarah Palin is the most over hyped person on planet earth and i don’t know why people get so jobless knowing more about her. Nice results from Google this year. damn Obama beat Jessica Alba .. I mean I voted for the guy and all but come on … he looks really funny all oiled up in a swimsuit. Great post…will be sure to use these key words in my sites and blogs. Not surprised about Heath Ledger being in the top 5. His death definitely rocked a lot of people. That is weird I would have not have thought those would be the top searches. However you could do a psychology study on the searches; based on the 3 E’s Environment, Education, and Economic standing. How do these E’s affect the searches in google and yahoo, and why.